The MoCo just announced a series of "Cafe" parts for the Sportster line: solo seat with that "racer" rear end part, clip-ons, bar end mirrors, and rear sets. Thank you for the information any information on dyna style look or just cafe? If you are curious about my brake lines. 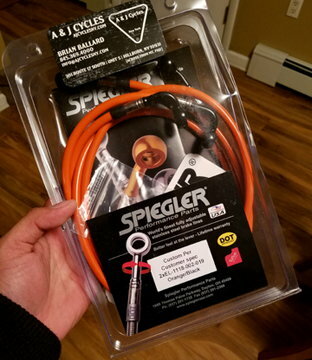 I had it custom made from Spiegler. How long were the steel lines you ordered? Spiegler doesn't have HD as a "kit" on their website; How did you match their parts to the part/size you need? I missed your post. If it's still worth anything, it's 11.5" HCP risers. You'll be surprise how much researching and measuring can help you. I ordered 42" length. Just order the one for the Sportster and choose your bend on the Banjo. I believe all Sportster have the same banjo sizes. There is no Brake kit for 2017 Roadster, you have to do build your own. Banjo is the hardware on the line.